The 54th Cleveland Hike, one of the Brigade’s national 2-day hiking events, was won by 25th Teesside Company. 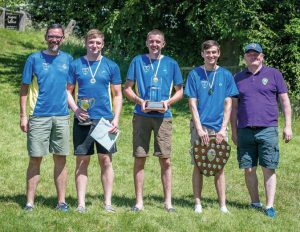 The 25th, who hail from New Marske, used their local knowledge to good advantage over the 33-mile hike in the North York Moors National Park. The hike incorporates 9 check points, to ensure teams can be safely monitored, and to allow the teams to be challenged with mental and physical tests, for example, a written quiz or carrying objects round a course. The infamous ‘water incident’, in the River Esk, where teams could cool off was particularly appreciated. Well done to all that took part in the hike and of course all those that made it possible.